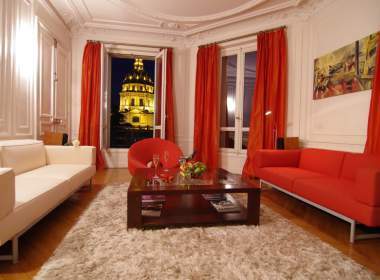 High Ground floor in historical building with views of Seine River. A Luxury large and stylish Parisian property for family and friends Special Occasion. 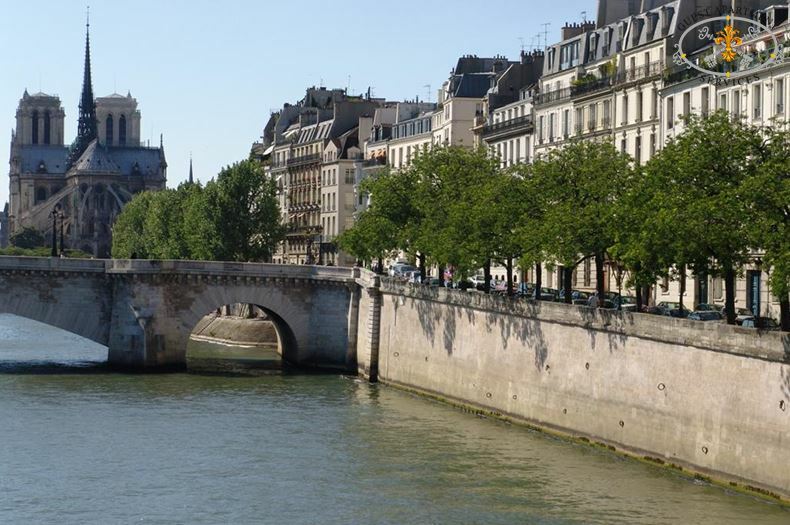 The Ile Saint Louis is literally in the historical heart of the City. A small Island in the Seine River, next to the well known Notre Dame Cathedral on Ile de la Cité. 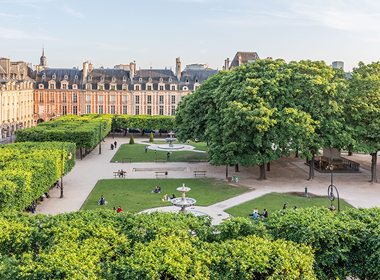 It is one of the most charming and exclusive neighbourhoods Paris has to offer. 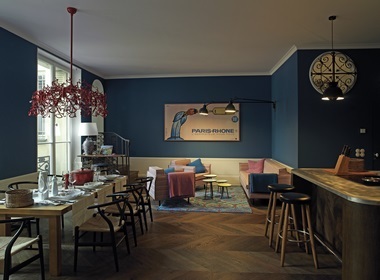 The setting could not be more convenient to exploring every arrondissement, right in the middle and between the Left bank and the Right bank. 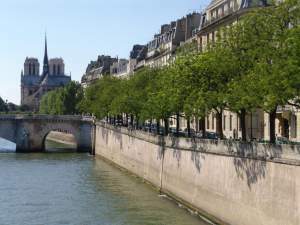 A 5 minute walk to Notre-Dame Cathedral, Beaubourg centre, the Marais area or Saint Germain des Près. You are also a short walk from all the necessary fine shops and services on the Island itself which will make your stay especially enjoyable: bakery, grocery, wine and cheese shops…but also all services such as bank, post office, pharmacy…Not to forget the numerous nice restaurants, art galleries, and the famous ice cream Berthillon, are all close by. 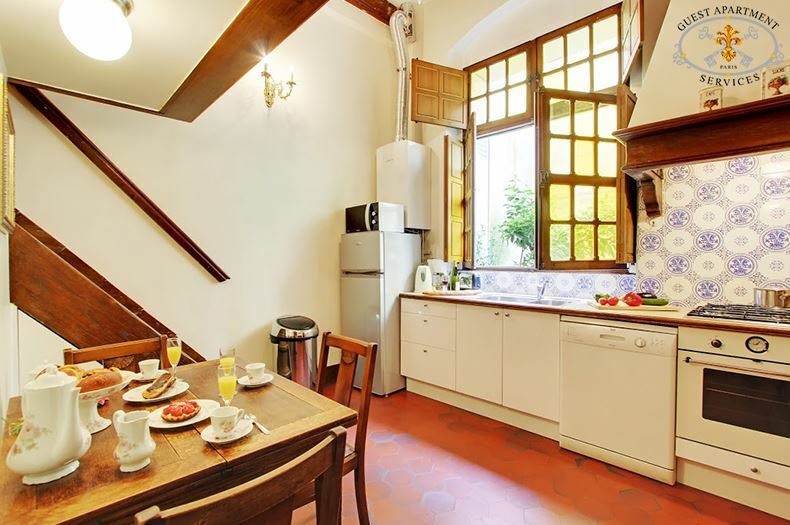 This large and tastefully furnished Paris vacation rental apartment is situated on the noble floor (1st floor) in the courtyard of a 17th century Hôtel particulier. A long passageway leads throught the front doors of the building to a very pretty and renovated courtyard. 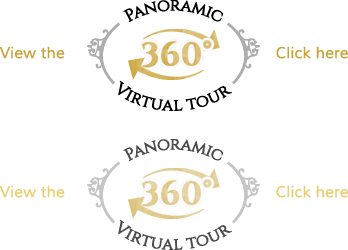 A short flight of steps lead up to the front door of your property. This Hôtel particulier is a classified historical monument which was once a town house for noble family.The apartment is sunny, bright, very calm and also offers a view of the Seine and the left bank. This Paris luxury rental apartment combines the charm of « le Grand Siècle » with the comforts and the convenience of today. Elegant and luxury French style antique furnishings, exposed ceiling beams, stone flooring in the foyer, wall and ceiling moulding. On entering the foyer vestibule, with wood paneling, there is a nice antique chest of drawers with a marble top, a silver lamp to welcome you into the elegant luxury rental apartment. A Louis XVI era salon presents original sculpted paneling, large Louis XVI mirror, deeply inset bibliothèques, cut glass chandelier, parquet floors. The antique furnishings recreate an 18th century ambiance (contemporary comfortable large couch, chairs and armchairs of the Louis XVI style). Coffee table, antique desk, ambiance lamps and 19th century framed oil paintings add to the elegance of this room. A tall leaded glass window brings light and a beautiful view of the Seine. A master suite offers sculpted marble fireplace, an original parquet, a built-in mirror surmounted by a painted wall panel providing a marvelous landscape. The tall leaded window provides daylight and a view of the Seine again. On each side of the King sized bed there are tables and reading lamps. Facing the window is a Louis XV style desk for pleasant reading and writing facing the Seine. 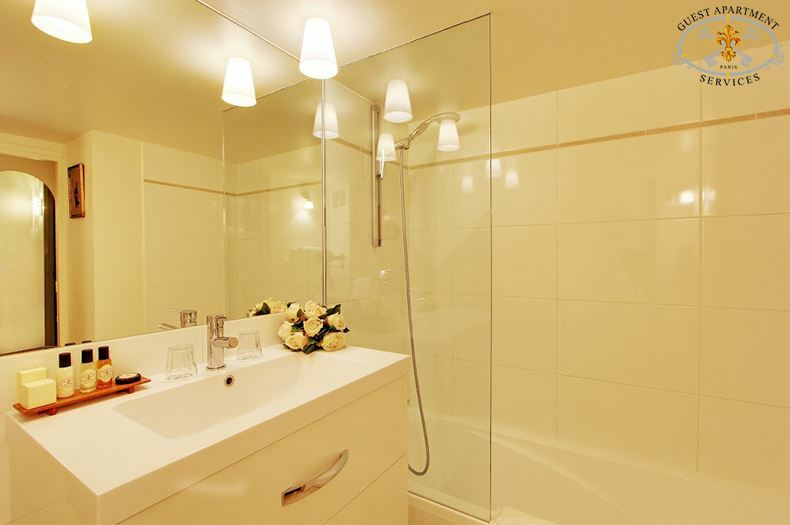 In the adjoining bathroom you will find a wash basin and a lit mirror, bath tub with shower fixture, and WC. There are cabinets to store all personal belongings. Hair dryer available. A second bedroom offers a King Size bed with bedside tables. For your convenience twin beds can be organized here upon request. A wooden armoire, chest of drawers, paintings and lithographs decorate the walls. A second bathroom with WC is next to this bedroom. A door opens from the dressing room into the hallway between the entrance and the kitchen. 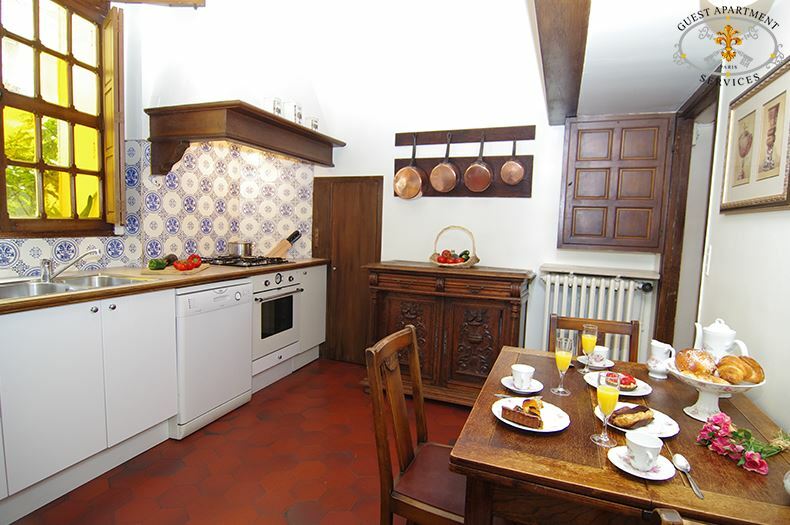 The huge kitchen with high ceiling also has dark wood paneling, magnificent brass chandelier, Delft style tiles and a tall window with a view onto a small garden. All this convies a quaint Dutch style. All the necessary accessories and electrical appliances are at your disposal: dishwasher, refrigerator, freezer, washing machine, dryer, conventional oven, microwave, coffee maker, electric kettle and toaster. All dishes, cutlery, glassware, table clothes are provided. A small set of stairs lead up to the third loft bedroom offering privacy and comfort with closing curtains. This “chambrette” welcomes a double bed and bedside tables and reading lamps. In addition to the adjoining third smaller bedroom there is an extra room where one store suitcases which can be exceptionally transformed into an extra fourth small bedroom with another double bed (for extended families, up to 7 guests). Other amenities include: TV with cable and all international channels, hi-fi stereo with CD player, private telephone with answering machine. This building has a live-in land lady. There is intercom device for your security. NOTE: FOR EXTENDED FAMILIES OR PARTIES, TULIP PROPERTY (1 BEDROOM) & ORCHID PROPERTY (3BEDROOM) OFFER AN EXCELLENT COMBINATION. BOTH PROPERTIES ARE LOCATED IN THE SAME BUILDING, OFFERING SPACE & PRIVACY FOR EACH MEMBER. THIS COMBINATION CAN SLEEP UP TO 9 PERSONS.